The Ohio Department of Higher Education administers the Ohio College Opportunity Grant (OCOG) program, which provides grant money to Ohio residents who demonstrate the highest levels of financial need (as determined by the results of the Free Application for Federal Student Aid (FAFSA) that should be completed) who are enrolled at Ohio public colleges or universities, Ohio private, non-profit colleges or universities, and Ohio private, for-profit institutions. Ohio residents in an associate’s degree, first bachelor’s degree, or nurse diploma program at an eligible Ohio or Pennsylvania institution with an EFC (Expected Family Contribution) of 2190 or less and a maximum household income of $96,000. +The fixed Pell/EFC combo of $6,095 continues to exceed the average tuition and general charges at community colleges and therefore, consistent with past practice, no OCOG awards will be available to students attending these institutions unless they otherwise qualify for foster youth status, Federal Veteran’s Education benefits, or third-term OCOG. These students may be eligible for up to the public main campus award amount. 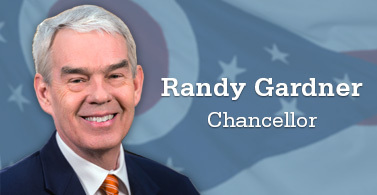 +The fixed Pell/EFC combo of $6,095 exceeds the average tuition and general charges at university regional campuses and therefore, no OCOG awards will be available to students attending these institutions unless they otherwise qualify for Federal Veteran’s Education benefits or third-term OCOG. These students may be eligible for up to the public main campus award amount. *Eligible foster youth at community colleges may qualify for OCOG using main campus award amounts. *Eligible students receiving federal veterans’ education benefits at community colleges and regional campuses may qualify for OCOG using main campus award amounts. *Eligible students attending a community college or regional campus year-round who have exhausted their Pell grant for the year, may be eligible for a main campus term award for the third-term. ** Tuition level/costs are the determining factors in receipt of an OCOG award and therefore students at these institutions have an adjusted OCOG award amount. If the student attends year-round, they may be eligible for an award up to the public or private, non-profit award amount for their third term once Pell grants have been exhausted for the academic year. ***Amounts for Ohio residents attending eligible Pennsylvania institutions-- $600/$300 figures to non-veterans apply and $800/$400 figures to veterans.​. The application deadline is October 1 of each year. The deadline to complete the 2018-2019 FAFSA is October 1, 2018. The 2019-2020 FAFSA opens on October 1, 2018 and the deadline for OCOG consideration will be October 1, 2019.